In 1991, Stephen King made his fans take notice for two big reasons. First, his then-new novel Needful Things was his return to authorship and fiction since his well-known rehabilitation from drugs and alcohol, getting fans quite excited to see what the modern king of horror would throw at them with a clearer mind and body. Then, the novel was touted on its cover as “The Last Castle Rock Story.” For his own sake as much as fans’, King only went back on the second noteworthy item, releasing a short story set in the fictional town a couple of years later. Hollywood came calling to translate the novel to film. New Line Cinema hired Fraser C. Heston, mostly known for TV movies, to direct. Heston had been in the business literally since infancy, having played the baby Moses in the 1956 Bible epic The Ten Commandments. 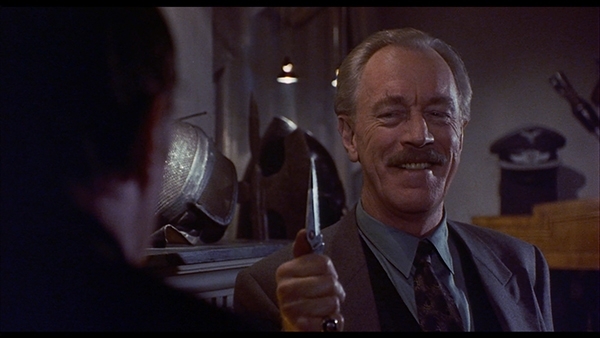 The big get for the cast was veteran acting legend Max von Sydow in the role of Faustian shopkeeper Leland Gaunt. Von Sydow was, and is, well known his roles in Bergman films just as well as his role as Jesus Christ in The Greatest Story Ever Told and for his performance as Father Merrin in William Friedkin's The Exorcist. He’s also memorable for his performances in less successful films such as Flash Gordon and the David Lynch adaptation of Dune. Needful Things would turn out to be in the latter category, released in January of 1993 and grossing $15 million. Roger Ebert’s review at the time of release called the film repetitive and “depressing,” and he is part of the reason why Needful Things currently stands in the mid-20s on Rotten Tomatoes. But that’s not to say there isn’t fun to be had in this movie! There is! You just have to go looking for it. As hinted above with von Sydow’s casting, this film is filled with fun performances from great character actors. JT Walsh, from several Grisham adaptations, A Few Good Men and Good Morning Vietnam plays his heart out as the slimy town accountant with a gambling problem. (Side note: did JT Walsh ever not play a slimy character?) Amanda Plummer, who you’d probably better recognize from So I Married an Axe Murderer or as Honey Bunny in Pulp Fiction, plays the town eccentric with reserved quirkiness. Bonnie Bedelia, Holly McClane herself, plays a diner owner racked with arthritis. William Morgan Sheppard plays the town’s Catholic priest, in bitter rivalry with the town preacher, played by Don S. Davis, who you’d likely know from Twin Peaks’s original run where he played Major Garland Briggs. Leading the cast as town sheriff Alan Pangborn is Ed Harris, playing an overworked anchor for the town of Castle Rock. Before Gaunt even moves his shop into town, tensions are running deep in the fabric of this quiet village. Old sins and simmering feuds drive the days in town, as the villagers gossip over their coffee at the town diner, and at night the town drunks argue over the jukebox at the tavern. It’s tense, but it’s a predictable tension, as small towns often have. Leland Gaunt arrives to Castle Rock, curios in tow, and sets up shop in a corner building of the main street. He gets straight to work, offering prized possessions to those who would covet them, in exchange for a paltry amount and favors to be named. There’s a kind, paternal side to von Sydow’s Gaunt, as all he offers are whispers and half-hinted suggestions. He finds a way to say exactly what those who walk into his shop want to hear, and sounds perfectly reasonable in making suggestions in how they can pay him back. The most gleeful side to Gaunt’s proxy prank war, though, is this: every prank pulled is pulled by a person not involved in a dispute with their victim. It all plays out like a rock-paper-scissors of Strangers on a Train. Everyone gets victimized in Needful Things, and everyone suspects their rival, cascading the violence and evil throughout the town in predictable (but fun!) methods. The film truly captures the pettiness of small town politics and disputes, all big fish in their little pond, angling for room to breathe. Needful Things’s biggest problem as a film, is one of perspective: rather than focus on the madcap chaos Gaunt sows in Castle Rock, by following his view of the mayhem, the film’s focus is on Ed Harris’s Pangborn, trying to clean it all up. What little we do see of the small, banal evil in the hearts of the people of Castle Rock is all that more precious for its depiction. But if you can focus on it, and hold onto it as you watch, there’s fun to be had. Gee, now I sound like Gaunt, don’t I?